EnergyCAP takes the guesswork out of energy budgeting by helping you create detailed meter-by-meter and month-by-month budgets based on up to three years of historical utility bill data. Granular budget information can be “rolled up” and summarized at any level of the organization, modified (globally or meter-by-meter), and then used for reporting. You can also adjust the budget globally by a specific amount or make global percentage adjustments, and then drill down meter-by-meter for fine-tuning. Create budget scenarios (actual, best case, worst case) to forecast expected energy usage, cost, and unit cost. Each budget can be adjusted to compensate for unexpected use, weather, rate increases, and other variables. 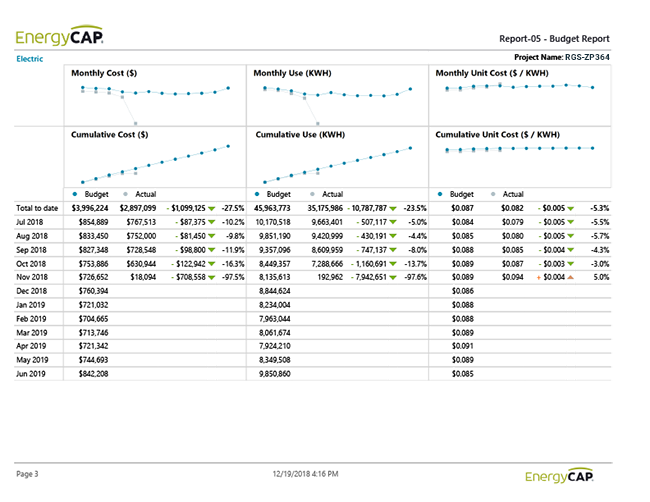 EnergyCAP also provides use/cost vs. budget reports to make it easy to see how you’re doing month to month.